Not long ago a church history professor at a prominent Protestant seminary remarked to us, “No topic touches young evangelical students more than monasticism.” Surprised? We were. Why monasticism? Why now? In 1996 Kathleen Norris's Cloister Walk, the quiet memoir of a Protestant woman's experience in a Benedictine monastery, became an unexpected New York Times bestseller. In recent years, monastic spiritual disciplines such as lectio divina, a way of meditating on Scripture, have enjoyed newfound popularity among laypeople—seen, for example, in Eugene Peterson's Eat This Book, published by Eerdmans in 2006. In the midst of a frenetic, fragmented culture that glorifies independence, busyness, and material gain, many are seeking out a countercultural lifestyle that values prayer, silence, simplicity, liturgy, hospitality, community, and care for the poor. Just do a quick search on Amazon.com and you'll see what I mean. Titles like Seeking God: The Way of St. Benedict, St. Benedict's Toolbox: The Nuts and Bolts of Everyday Benedictine Living, or How to Be a Monastic and Not Leave Your Day Job all testify to the fact that people are finding something they long for in the simple ideals of the pioneering sixth-century monk Benedict of Nursia and the movement he sparked. And they are struggling to know how to apply those ideals in the rough and tumble 21st century. 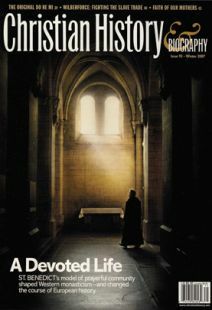 As Chris Armstrong's article in this issue describes, in addition to the traditional forms of monasticism that are still going strong, there is currently a movement among Protestant young adults to live communally and sacrificially in ways that draw upon Benedictine principles. “Listen.” That's the first word of the monastic rule written by Benedict. It's an appropriate word to emphasize in this issue, because I believe that learning about the history of Christianity should be first about listening—really listening—before judging and before acting. History can teach us humility when we learn to understand the world through another person's experience in another time and place. CH&B tries to be a listening magazine, and this occasionally irritates readers from various points on the theological spectrum. Some Catholic readers point out the ways in which our latent Protestant perspective can skew the facts or blind us to certain aspects of their history. Some Protestant readers get upset when we present Catholic subjects without doing a point-by-point theological critique. Some Eastern Orthodox readers (few but vocal) feel left out when Orthodox perspectives and topics don't appear often enough. I hope that as we listen together we can approach the complexities of the past and the challenges of the present with humility and deeper understanding. Monasticism is one of many intriguing historical conversations. I encourage you to eavesdrop. Jennifer Trafton is managing editor of Christian History and Biography. Benedict's Rule became the gold standard of monastic life. For centuries, monks were at the center of the Western missionary enterprise.